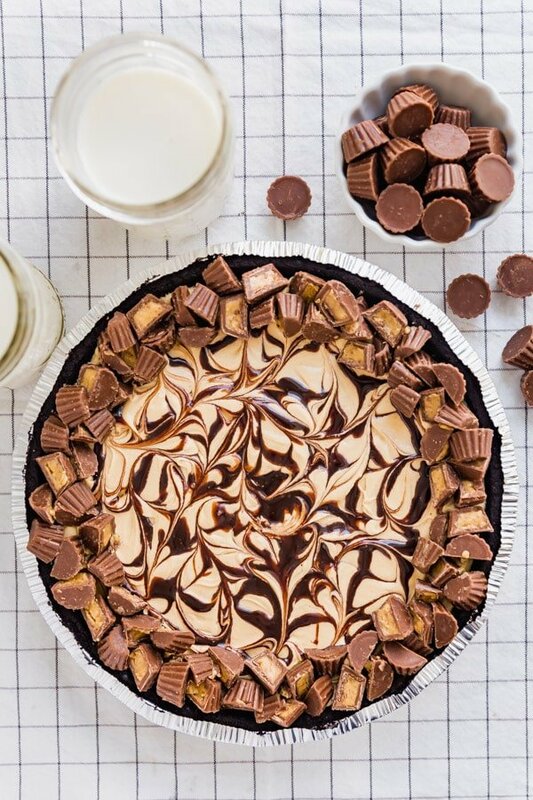 You guys, this peanut butter pie recipe is no joke. Like, a serious game changer. Rich, creamy, dreamy, peanut-buttery, Oreo-cookie-crusty happiness (crusty?! I don’t know, just bear with me haha!). I can barely handle it. 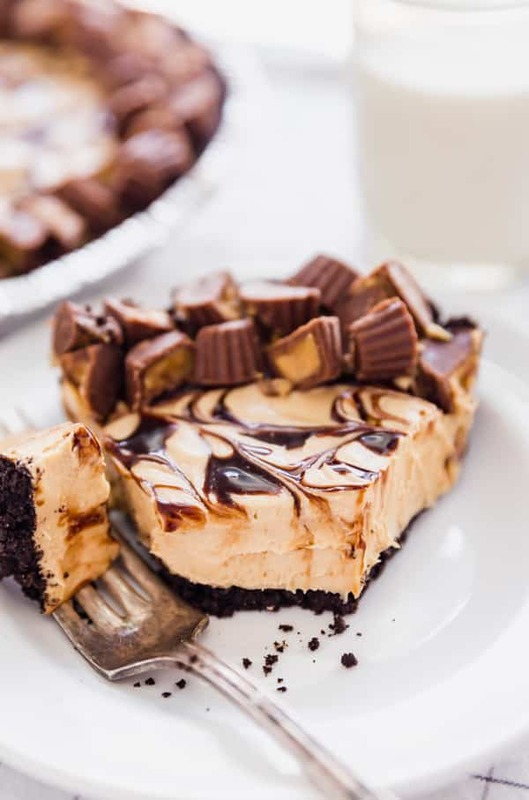 And then, to bring it over the top, I’ve added mini Reese’s Peanut Butter Cups. I know. 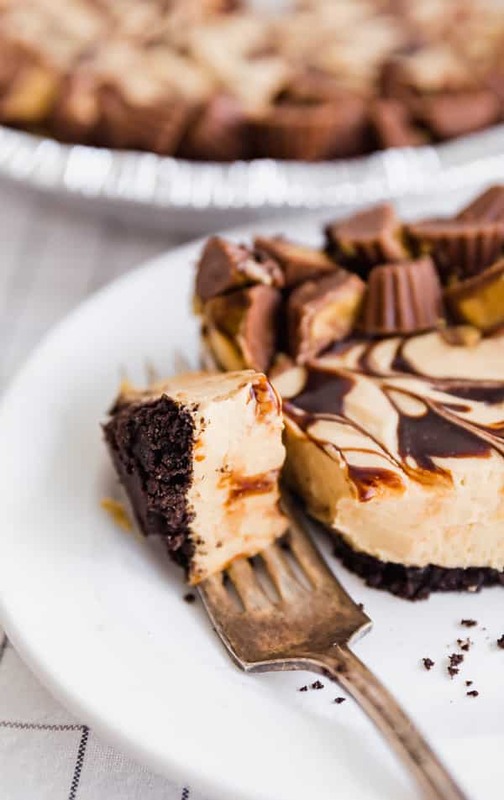 If you love chocolate and peanut butter, this is the peanut butter pie recipe for you! It’s super rich, so you don’t need a huge piece, which is great because you can feed more people that way. And best of all, its no-bake! 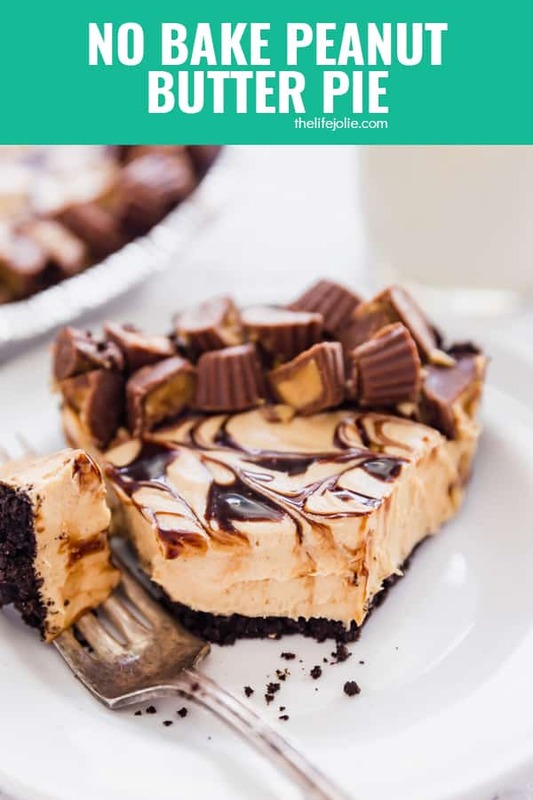 Since this is technically a chocolate peanut butter pie, I used an Oreo cookie crust. I went the pre-made route because I never seem to have good lucky making my own crumb crusts. Those pre-made crusts are also a huge time saver! Melt the peanut butter a bit before adding it to the mixing bowl. I tested it both ways and while the unmelted version was still delicious, melting the peanut butter makes for a smoother filling. Allow the pie to set for an hour or more. In my opinion it also tastes better chilled. When you’re swirling the chocolate sauce, less is more. It’s very forgiving in general, but I’ve found that minimal swirl heed the prettiest swirls. Don’t skimp on the Reese’s Peanut Butter Cups! Because who doesn’t love them?! 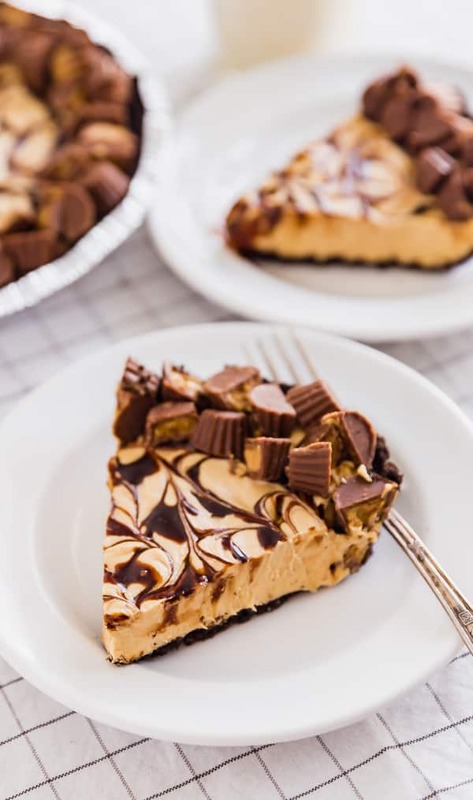 No Bake Peanut Butter Pie is the dessert that dreams are made of and best of all, it's no bake! You will make this again and again! Warm the peanut butter in the microwave for around 30 seconds to melt a bit (you can always go longer if it's not pourable). Add the peanut butter into the mixing bowl along with confectioner's sugar, cream cheese, vanilla extract and salt. Beat well for 1-2 minutes until everything is well combined and creamy. Pour the mixture into the Oreo cookie crust and smooth the top with a spatula. Squeeze some chocolate sauce onto the top of the pie (I squeezed it in concentric circles) and then take a toothpick and lightly swirl it. Less is more when it comes to swirling. 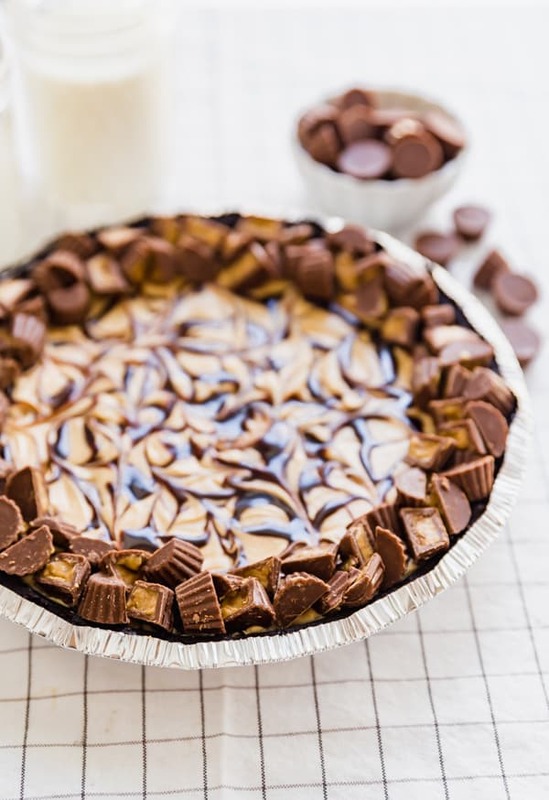 Put the cut up mini peanut butter cups all around the edges of the pie, near the crust. Mini Reese's Peanut Butter cups can usually be found in bags with the ice cream toppings near the freeze section- they're smaller than the Mini Peanut Butter Cups that come wrapped, which are usually sold in the candy section. If the little one's aren't available, you can always buy a bag of the wrapped ones and just chop them a bit smaller. April 17, 2018 at 10:10 am Peanut butter cups are the best! This looks delicious. April 21, 2018 at 3:00 pm Thanks Lindsay! April 24, 2018 at 9:00 am Looks like heaven. Can't wait to make it this summer! April 24, 2018 at 4:57 pm Thanks Krissy- It was super difficult not to keep eating the whole thing! September 4, 2018 at 10:04 am Can I use fresh whipped cream instead? September 4, 2018 at 9:17 pm Definitely- I bet it will be even better! Just change it out for the same amount (and make sure you measure after you whip it). I hope you enjoy it!